A location in Glasgow city centre, Glasgow Cross is the point where the Trongate, Gallowgate and London Road meet the High Street, to the north, and Saltmarket, to the south. 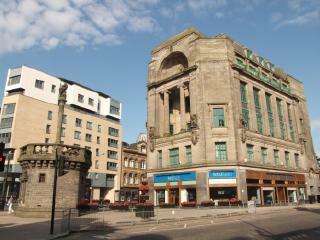 Located at this junction are Glasgow's Mercat Cross and a tall tower which represent the mains of the city's Tolbooth. This area was the focal point for the development of Mercantile Glasgow.